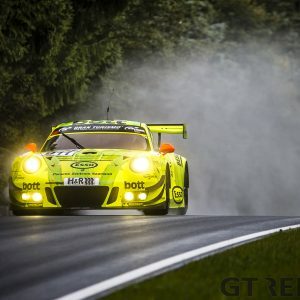 Last weekend a whole bunch of GT championships raced. 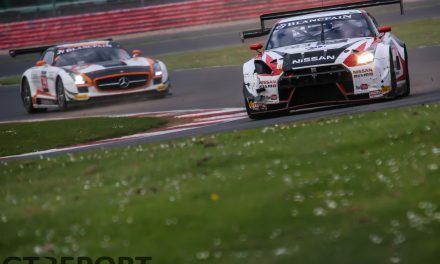 The first race of the Blancpain Endurance Cup was held at Monza with the GT4 European Series as support, while International GT Open raced at Estoril. The Pirelli World Challenge had its sixth race of the season at Barber Motorsports Park. 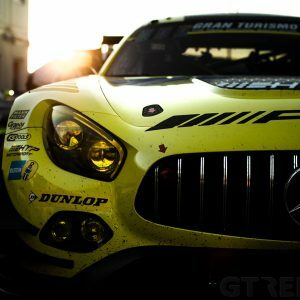 A massive field of 57 GT3 cars started at Monza for the Blancpain Endurance Cup. 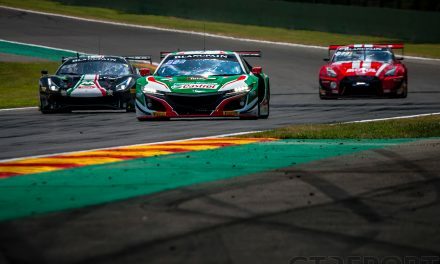 Avoiding backmarkers was important for the last part of the race, in which the number 58 McLaren 650S GT3 of Côme Ledogar, Rob Bell and Shane Van Gisbergen and the number 84 HTP Motorsport Mercedes-AMG GT3 of Dominik Baumann, Jazeman Jaafar and Maximilian Buhk battled for the win. Van Gisbergen managed to hold off Buhk for victory, after having started from twentieth on the grid and leading for almost two hours. 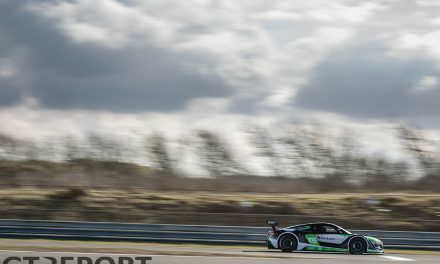 The HTP AMG finished in second, with the number 8 M-Sport Bentley of Andy Soucek, Wolfgang Reip and Maxime Soulet on the third spot of the podium. Fabrizio Crestani started the first race of the International GT Open season from pole in the number 27 Team Lazarus Lamborghini Huracán GT3. He kept the lead for only two laps, as both the number 59 McLaren 650S GT3 of Duncan Tappy and Phil Keen’s number 22 Balfe Motorsport Ferrari 458 Italia GT3 passed Crestani. The pitstops turned out to be decisive. The number 22 Balfe Ferrari, now driven by Shaun Balfe, came out in first place with a big margin over the second placed Michael Benham in the number 59 McLaren. Benham wasn’t able to challenge Balfe for the victory and slipped back to fifth, handing the second place to Gustavo Yacamán and Fernando Monje in the number 2 Teo Martin Motorsport BMW M6 GT3. Right after the pitstops of the second race, the fight for victory seemed to go between the number 27 Team Lazarus Lamborghini of Thomas Biagi and Fabrizio Crestani and the number 88 McLaren of Alexander West and Kévin Estre. A collision on the last lap ruined the opportunities for both teams. While Crestani managed to take third after the contact, West had step out of his car. Michael Benham and Duncan Tappy were the lucky ones, giving the number 59 McLaren its first win. Andrés Saravia and César Campaniço took second in their number 5 Drivex School Audi R8 LMS ultra GT3. 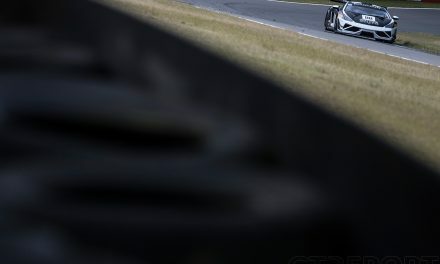 Álvaro Parente had the best start and took the lead in his number 9 K-Pax Racing McLaren 650S GT3, ahead of the pole sitting number 8 Cadillac ATS-V.R GT3 of Michael Cooper. Fifty minutes later, when the chequered flag was flown, the order at the front was exactly the same, despite some small errors of Parente and a full course yellow. Right behind his team mate, Johnny O’Connell took the third place in his number 3 Cadillac. It was Parente’s second win in a row in the Pirelli World Challenge, having won the race in Long Beach as well. After two races won by Parente, a new driver emerged victorious at Barber Motorsport Park. Parente started from pole position but lost the lead to Michael Cooper’s Cadillac after only five turns. 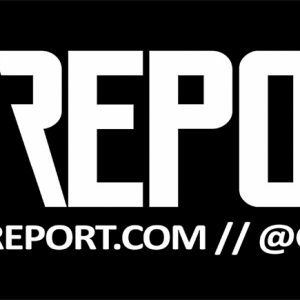 After pulling away in the opening stages of the race, Cooper and Parente were caught by Johnny O’Connell in the other Cadillac and the number 31 Effort Racing Porsche 991 GT3R of Patrick Long. But positions did not change, which made Cooper the fifth driver to win a race in just seven races this season. Bernhard van Oranje and Ricardo van der Ende of the number 9 Racing Team Holland BMW M4 GT4 led most of the first European GT4 race at Monza, but they were unable to hold on to the top spot as they lost pace in the final laps. 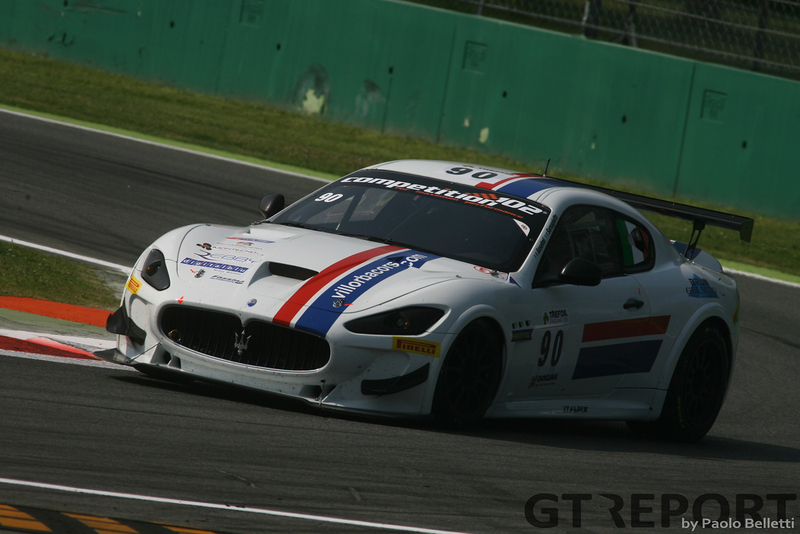 Luca Anselmi and Giorgio Sernagiotto won the race in the number 90 Villorba Corse Maserati Trofeo MC GT4. Van der Ende and Van Oranje were promoted to second after a penalty for Henrik Still and Andreas Gülden in the number 11 Sin Cars Sin R1. The second race was decided by a red flag in the closing moments of the race. Tim Coronel’s number 72 Racing Team Holland BMW lost oil, which made it too dangerous to race the full distance. It meant that Romain Monti took the win in his number 46 Maserati, after being passed by both of the V8 Racing Chevrolets right before the red flag came out. On the lap from which the results are taken, Monti was in front so he was awarded the win, in front of Duncan Huisman and Luc Braams in the V8 Racing Chevrolet Camaro GT4 and Jelle Beelen and Marcel Nooren from the same team.